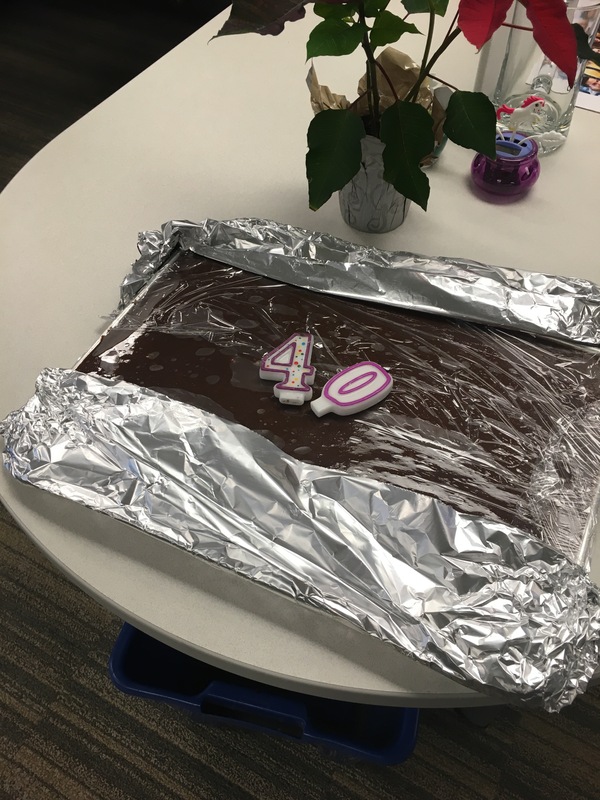 So this past weekend was my 40th Birthday. Naturally the celebrating started last Tuesday and concluded Monday night. Tuesday night The Hubby, The Kid, My Dad and his Girlfriend all went out to the local German Buffet. I had been about 2 years since we went, since I was never sure if there were things The Kid would eat. As luck would have it he found many a thing to eat and we will once again be able to frequent the Buffet. We had a great time visiting with my Dad and his Lady Friend. Wednesday was another Buffet day this time for lunch with the Work Girls. Thursday was the Cupake Truck visit to the office but the height of the work celebrations was on Friday. Every couple months or so my colleagues who sit around me and work in the Sales Dept decide to have a Pot Luck. April someone had the bright idea of it being a Cinco de Mayo theme, yes I know a week early, and my Sales Partner volunteered to bring dessert which happened to be a Birthday Cake for me. 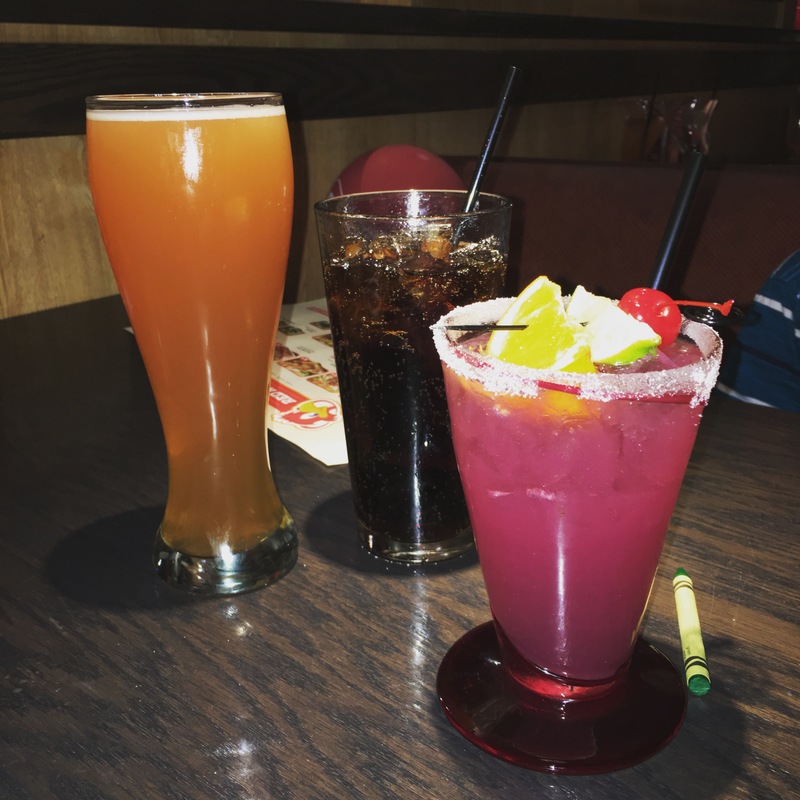 Friday night The Hubby, The Kid, and I went to Red Robin for dinner, hey a free burger is a free burger. Not only did we get some Fancy Drinks, but we also got some fried pickles. I loves me some fried pickles. It was Burgers for me and The Hubby and ya know chicken fingers for the Kid cause that’s what Kids eat. Saturday Morning (the actual day of my exiting of the birth canal) I got to sleep in until 8am! 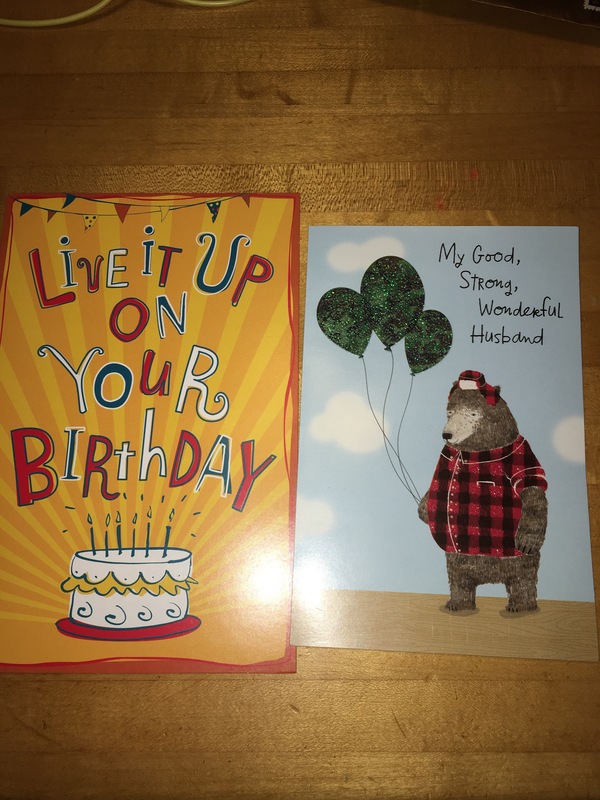 I know it was glorious, I was gifted with 2 cards, and a Pool float from the family. I was also finally let in on the surprises that lay ahead of me. The first surprise was I had to pack the bag for The Kid so he could have a sleepover at my Brothers. 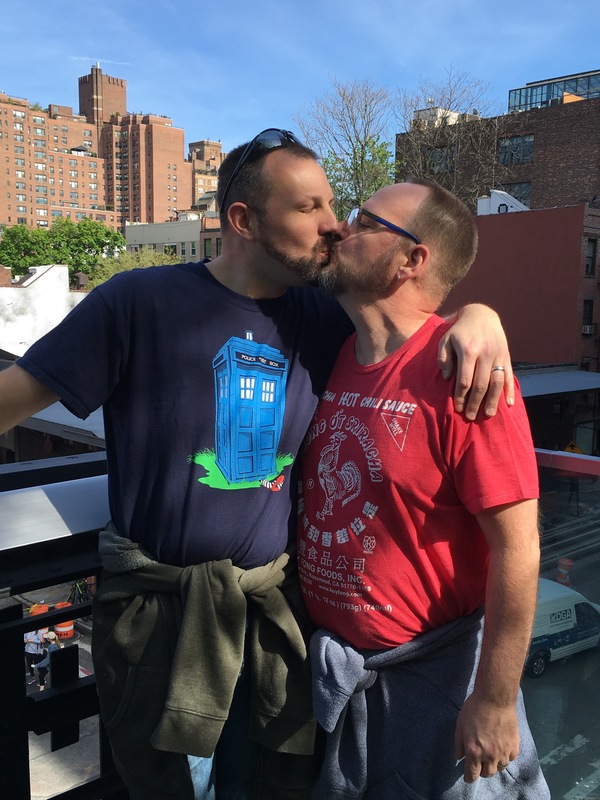 Then I had to change the sheets so that The Nephew could stay the night with the Dogs, because the best surprise was we were spending the night in NYC just the Hubby and I. But those weren’t the only surprises, The Hubby kept a couple things close to the vest until it was time to actually do them, but for the bulk of the day/night I knew was was planned. First up was dropping The Kid off at TaeKwonDo so we could escape into the City. Once in the city were heading to the Hotel, and waited for our friends Mike and Geoff to meet up with us. While we were waiting for our friends the Hotel offered us a complimentary drink. The Hubby had a Gin Martini (the only proper Martini), and I had a Moscow Mule. This was one of the best Mules I have ever had. 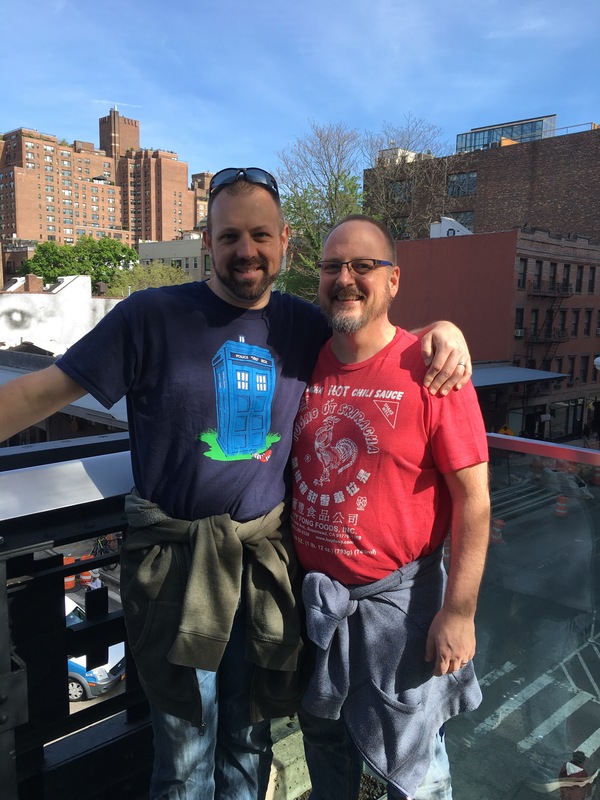 From the Hotel we moved on to spend a couple hours at The High Line – The High Line is a public park built on a historic freight rail line elevated above the streets on Manhattan’s West Side. 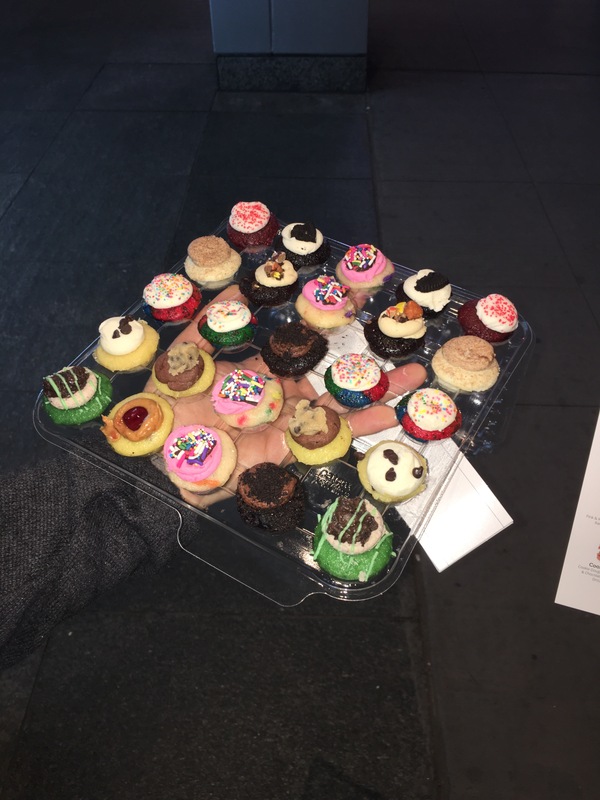 It runs from Gansevoort Street in the Meatpacking District to West 34th Street, between 10th and 12th Avenues. It really is remarkable that this place exists. Since the weather was gorgeous, as you can see in the pics below, it was jam packed with quite a bit of eye candy for the 4 of us follow around. 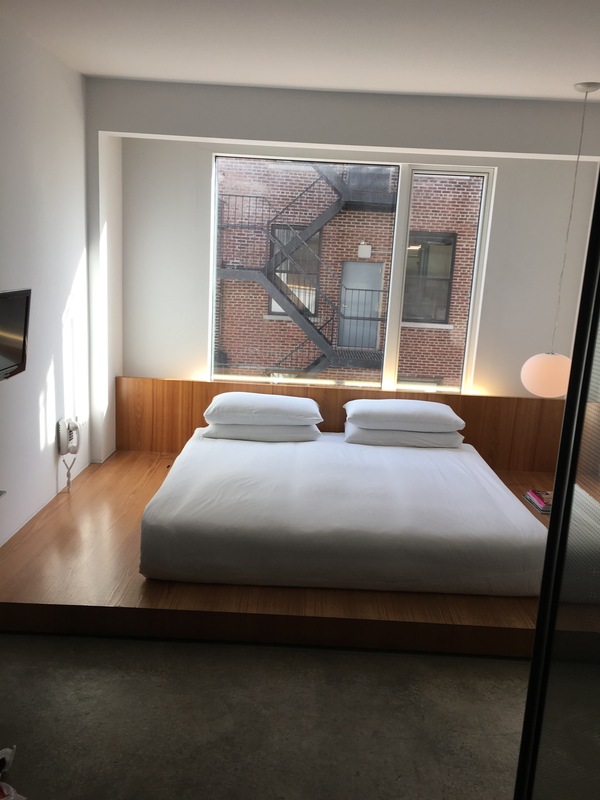 After our walk we headed back to the Hotel Americano to change and relax a bit before we walked the 25 blocks north to meet 2 more friends Glenn and Bill for Birthday Dinner. The room was amazing, and small, but not amazingly small. The view was decent, I mean it is Chelsea so there isn’t much to see. It had all the comforts of an oversize Cruise ship room. The bathroom had a fabulous glass enclosed shower the actually looked out into the room. What I missed getting a picture of was the Beanbag chair that was in the corner, or the BJ chair as we called it. 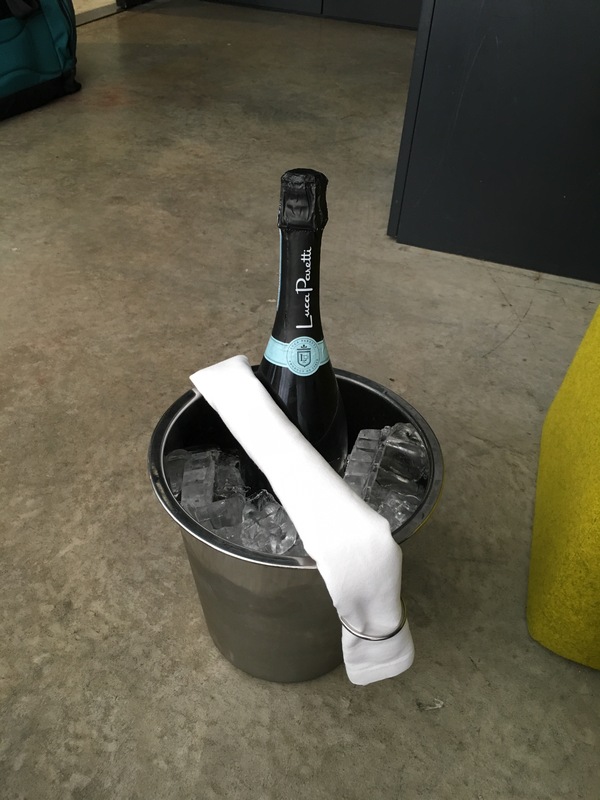 To make our stay even that much more pleasurable the Hotel sent up a bottle of bubbly for us to enjoy before we headed out to dinner. It was a very nice way to start the evening, drinks with friends in a hotel room in the City. The Dinner location was the 2nd to last last surprise that the Hubby wouldn’t give me any clue about. So we hoofed it up to Hell’s Kitchen and found our friends who, after the initial place they were thinking about going was too crowded, decided we would eat at a new place called The Jones. Not surprisingly there was a wait but only about a half an hour. We sidled up to the bar and had a round of drinks while we waited. A few had the Sangria, both red and white, the Hubby had a beer and a bourbon, and I went all fancy and had The Unicorn – Mt Gay Golden Rum, St Germaine, Fresh Squeezed Lemon and Ginger Beer, it was simply delicious. We got our table and settled in and took it all in. 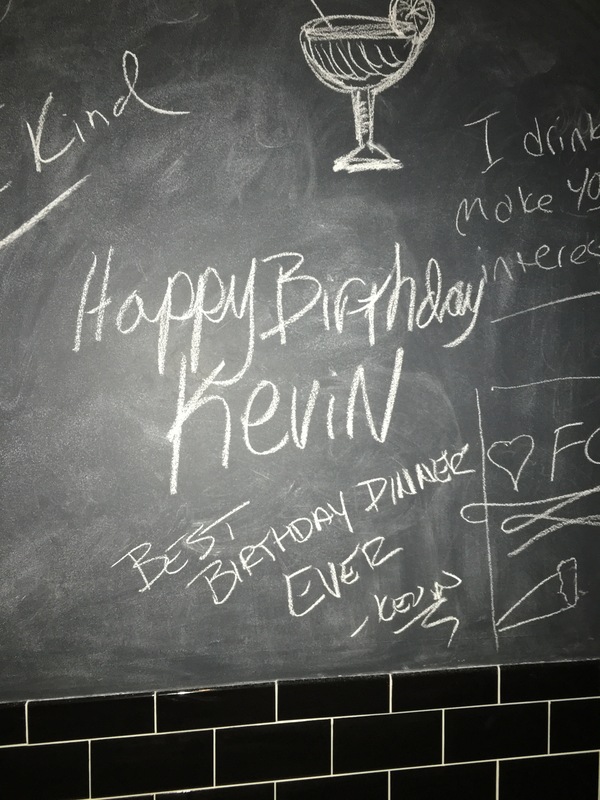 The service was excellent, the ambience was eclectic, and the Bathroom had a Chalk Board which Mike proceeded to decorate, and then The Hubby and I followed suit (The Hubby added his name below mine upon his visit). Dinner was AMAZING! We started with The Burnt Brussels Sprouts – Aged Parmesan, Fresh Herbs and House Aged Balsamic Gastrique, Coconut Braised Pulled Pork – Pasture Raised NY State Pork, Red Curry, Pine apple Rum Reduction, Jalapeno and Toasted Peanuts, and the Thigh and Pie – Brooklyn Bourbon Brined Chicken, Smashed Sweet Potato Pie, Vermont Camembert and Chicken Chicharrón. Geoff and I had the Pasta Special of the Day, Penne, Portabellos, Chicken and Bacon in a light white wine sauce. The Hubby, Glenn, and Mike had the Red Curry Roasted Chicken Breast – Roti Pancake, Baby Bok Choy and Baby Carrots with Kaffir Lime-Cilantro Butter, and Bill had the Mac and Jack – Wagon Wheel Pasta with Monterrey Jack Cheese and Frizzled Onions. There wasn’t a drop left of any of it by the time we finished. The last surprise was the Dessert Location. No it’s not the place in the picture below, this was just a pit stop on the way to Baked by Melissa. What we got there is shown in the next picture. Cupcakes and Macarons, it’s a good thing they were tiny cause I could have eaten way more of them than I did. After Dessert we bid adieu to Glenn and Bill and Mike, Geoff, The Hubby, and I walked off all the dinner and dessert the 25 blocks back to the Hotel to make the 2nd costume change of the evening. The Final stop of the night was The NY Eagle, this was a first time for The Hubby, Geoff and I ever going there, Mike had been there many moons ago. 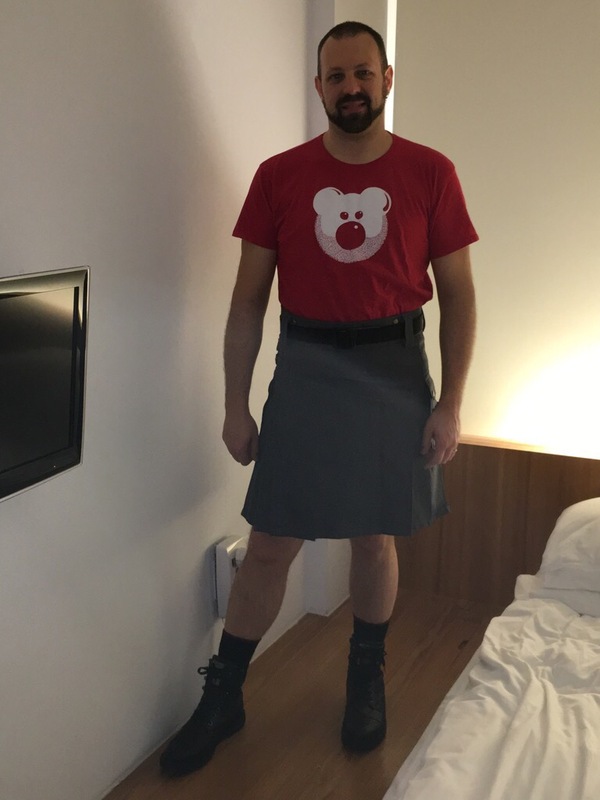 My bar outfit for the night was my Kilt, some boots we bought on the way into the city, and my Beardy Bear T-Shirt (which somehow fell off of me during our stay at the bar). We had a great time laughing, drinking, and checking out the sights. I think The Hubby and I agree we would definitely make another visit there at some point. After a recovery day in bed catching up on my sleep we headed out to our last night of bowling (that’s another post). Monday night I finished up the celebrations at the Monthly Social Gathering at a local restaurant, it just happened to be my month to go. So that about wraps up the week, the rain is in town for the foreseeable future and we have 5 Greyhounds laying about, our 2, the Foster who leaves next week, and 2 we are dog sitting until Sunday. Sounds like a great time! You deserve it! Very nice! Happy belated birthday!